Looking for something to do this New Year’s Eve? How about New Year’s Day? We’ve done some of the work for you! Here are a few spots around the Valley to ring in the New Year or get rid of the hangover the next day! On New Year’s Eve Burger Theory will be offering happy hour from 4 pm until closing at 12 am. The happy hour menu includes $2 off all appetizers, $2.50 Bud Light drafts and all other drafts are $4. Can’t make it in on New Year’s Eve? Cure that hangover at Burger Theory on New Year’s Day! January 1st is National Bloody Mary Day and Burger Theory will be offering a build-your-own Bloody Mary bar. There will also be NFL games all day. What better way to recover from New Year’s Eve celebrations than with a Bloody Mary, a savory burger, and football?! When the urge to get out of the house for a delicious New Year’s Eve dinner hits, turn to Casino Arizona. All six of the property’s culinary options, plus The Showroom, will be serving special menus on New Year’s Eve, offering the perfect meal with which to close out 2016 and begin 2017. Visit the Valley’s premier steakhouse between 5 p.m. to 12 a.m. on New Year’s Eve and enjoy the perfect meal to cap off a great 2016. To start, there will be Seared Diver Scallops with a citrus reduction or a Spring Mix and Spinach Salad with fresh sliced strawberries, crumbled blue cheese, candied walnuts and a honey-raspberry vinaigrette. Dinner is an eight-ounce Filet Mignon and a four-ounce Lobster Tail with grilled asparagus and garlic parmesan mashed potatoes. If there’s still room, finish with a Milk Chocolate Mousse with chocolate crumble and passion fruit sauce. Prix fixe: $49. All items available a la carte. Anytime between 4:30 and 10 p.m. on New Year’s Eve, stop into The Eagles Buffet for a Champagne Dinner. Enjoy the likes of Smoked Prime Rib, Roasted Lamb, Hot Steamed Crab Legs, Baby Back Pork Ribs, Whipped Potatoes, Baked Cod with Rice Pilaf, Chesapeake Bay Oysters, Clam Chowder, Seafood Gumbo, Fine Pastries and Desserts and much more. Adults: $32.95; Children: $19.95. The Showroom will feature an upscale, one-of-a-kind New Year’s Eve Buffet from 6:30 to 8:30 p.m. Sample Smoked Prime Rib with au jus, Roasted Lamb, Chicken Cordon Bleu, fresh asparagus, artisan bread, caesar salad, chilled shellfish, a pastry display and much more. Adults: $95. 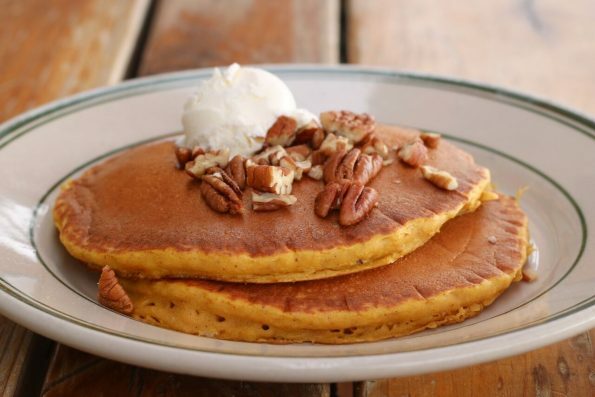 Get a bright and early start on New Year’s Eve with breakfast at Willows served from 6 to 11 a.m. Enjoy Blueberry Mascarpone Stuffed Crepes with bacon, sausage or tavern ham. The dinner special, served from 11 a.m. to 9 p.m., will be Lentil Soup, followed by Chicken Saltimbocca with garlic parmesan mashed potatoes and chef’s vegetables. Dessert will be a classic favorite: Old Fashioned Chocolate Cake. All items a la carte; $3 to $14.95. On Dec. 31, the Arizona Room Patio Grill will feature a New Year’s Eve buffet featuring a variety of luscious fare, including Creole Rubbed Ribeye Roast with Jack Daniels au jus, Roasted Turkey with desert rose honey and sweet chili glaze, Atlantic Salmon, shrimp cocktail, smoked domestic and imported cheeses, Fiesta Rice Pilaf, a dessert assortment and much more. Prix fixe: $85. On New Year’s Eve, there’s no need to take a break from bingo in order to eat — the Bingo Hall will bring the food right to you. Enjoy a Grilled Shrimp Quesadilla on a warm chipotle tortilla with a blend of cheeses, green onions, and diced tomatoes, garnished with tricolor chips and salsa. Finish off with chocolate-dipped strawberries. Prix fixe: $9.50. The Salt River Cafe will be open all day on New Year’s Eve day from 11 a.m. to 9 p.m. Begin with Shrimp Alfredo on a bed of fettuccine noodles, served with garlic bread and a fountain drink. For dessert, enjoy a Raspberry Cheesecake with Oreo cookie crust. Prix fixe: $9.95. 10:00PM $75/person. $25 for wine pairing. This includes party favors and champagne toast for this seating only. Pulpo- grilled fingerling potatoes, paprika oil, garlic and lemon. Tuna crudo- grapefruit, apple, fennel, chile/sundried tomato oil. Grilled Romaine Salad- romaine, red bell peppers, lemon buttermilk dressing. Salmon- truffle celery root-shrimp-cauliflower-crab/lemon buerre blanc. Duck Mole- squash, corn, braised duck, spiced chocolate mole. Filet- grilled beef tenderloin, cognac, creamy porcini mushroom and leek ragu, grilled asparagus and potatoes. Poached Pear- pisco, vanilla, almond/raisin crumble. Chocolate cheesecake- graham cracker dusting-chocolate. Italian Style Porchetta and Eggs- served with potatoes and grilled panettone. Crab Omelette- lump crab meat with jack cheese and topped with hollandaise sauce. Corned Beef Hash and eggs- house made. Filet Mignon- with mushroom sauce served with mashed potatoes and fresh brussels sprouts. Pomelo at The Orchard is featuring a New Year’s Eve prix fixe menu for two with the help of luxury champagne, Veuve Clicquot! The special menu, created by Chef Javi Perez, is offered on Saturday, December 31st, from 5 p.m.to 10 p.m. Seating is limited so RSVP by calling 602-633-2600 and mention you would like the New Year’s Eve menu. Pomelo Chopped—Dinosaur kale, artisan greens, tomato, corn, edamame, roasted peppers, gold raisins, toasted sunflower seed, feta and tossed in Green Goddess dressing. Wedge—Half head of iceberg lettuce, bleu cheese buttermilk dressing, crispy bacon, hard-boiled egg, and tomato confit. New York Strip *MR—(12 oz.) aAngusbeef grilled over Arizona Mesquite served with shrimp in a parmesan sauce, seasonal vegetables, and scalloped potatoes. Pan-Roasted Wild Salmon *M—Black rice, shaved fennel and wild arugula salad with citrus Pomelo beurre blanc. Salted caramel cookie—Warm salted caramel over shortbread cookie served with vanilla gelato, chocolate sauce, and fresh strawberries. Pomelo at The Orchard is part of The Orchard PHX, a two-acre venue located at 7100 N 12th St. in Phoenix. Two other concepts Luci’s at The Orchard and Splurge Ice Cream and Candy shop are also housed there. For more information on Pomelo visit their website PomeloPhx.com or like them on Facebook at facebook.com/PomeloPHX. 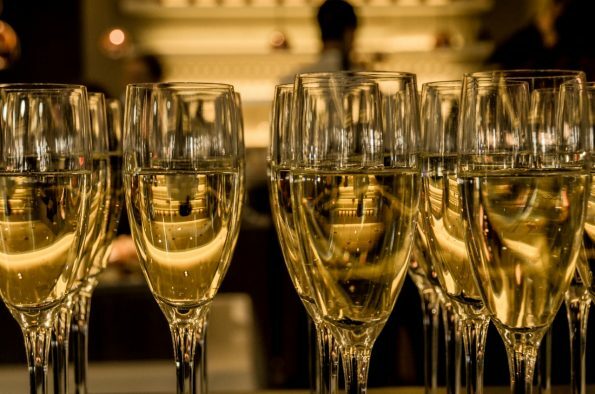 Toast to the New Year at Prado with a four-course prix-fixe menu and champagnes. Enjoy live Jazz and dancing from the talented Joe Costello throughout the evening. Stay until midnight for a special balloon drop to ring in the new year. After-dinner drinks available at Mbar until 2 am. Two seating options are available: 6:00 p.m – $95 per person & 9:00 p.m. – $125 per person. (9:00 p.m. seating includes champagne per couple.) Reservations call (480) 627-3200 or book online at OpenTable.com. 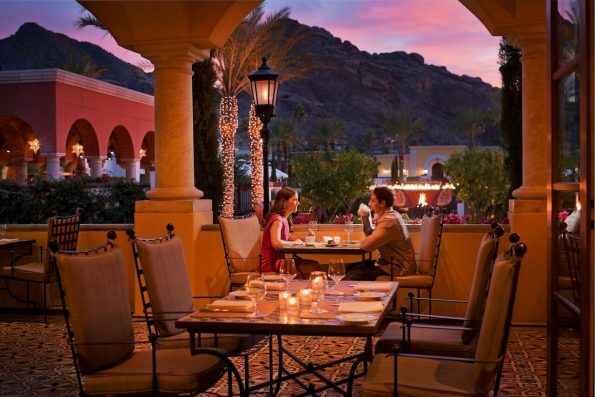 Elevate the evening with Prado’s Fireside Table Experience. This fireside table will be reserved exclusively for you and your guest complete with vintage champagne and dedicated service. Enjoy a masterfully comprised seafood tower complete with the works; including oysters, shrimp, crab, lobster, and caviar to start off your evening before diving into a personalized four-course menu. Sit and savor the evening fireside in your own private corner decorated with lavish floral arrangements, a plethora of candles to set the mood all while enjoying the last evening hours before the start of 2017. Live entertainment playing all night and a midnight balloon drop. And after dinner drinks at Mbar. Available for seating up to 8 people. Afterward enjoy luxurious overnight accommodations in a resort view room. To reserve or to inquire about reserving this unique experience or about creating a larger fireside party call (480) 627-3039. Get the New Year’s Eve celebration started early with happy hour in the bar area from 3 to 6 p.m. Munch on $6 appetizers, such as Sizzlin’ Peppers stuffed with a blend of four cheeses, served sizzling on a unique cast-iron skillet, or Carne Asada Street Tacos with cheese, chile de arbol salsa, marinated red onion and salsa de guacamole. Pair the appetizers with a $6 cocktail, such as a Fresh Squeezed Margarita, Dark and Stormy, or Sangria. For New Year’s Eve dinner, Sierra Bonita Grill will be serving its regular dinner menu, in addition to two Southwestern specials created for the occasion. The very popular Prime Rib dinner ($38) features a 14 oz. smoked prime rib served with green chile mashed potatoes, horseradish cream, and beef au jus. For a lighter dinner option, try the Pan Seared Jumbo Scallops ($39) served with a salad of tri-colored orzo, prosciutto, cherry tomatoes, organic baby arugula, toasted almonds and habanero champagne beurre blanc. Sierra Bonita Grill is located at 6933 N. 7th St., Phoenix, AZ 85014. For more information, call 602-264-0700 or visit www.sierrabonitagrill.com. Celebrate New Year’s Eve on Saturday, December 31 from 5 to p.m. with a memorable dinner at The Herb Box, inspired by James Beard Award-winning, Michelin-Starred Chef, Alex Stratta. In addition to its regular dinner menu, all three Valley locations of The Herb Box will be serving a special four-course prix fixe menu for $65 per person (plus tax and gratuity). The meal begins with Butternut Squash Soup with duck confit, wild mushrooms, pepitas and spiced cream, plus an Herb Grilled Shrimp and Fuji Apple Salad with arugula, radicchio, and frisee, with a balsamic vinaigrette. For the main course, choose from three different dishes. A Tenderloin of Beef with Red Wine Sauce is served with horseradish potato gratin and candied shallots. Roasted Chicken is accompanied by Swiss chard and caramelized parsnips and roasted garlic and Parmigiano polenta. For a seafood option, try the Pan Seared Sea Bass with orange glazed fennel, oven-dried tomatoes, clementines and basil butter sauce. Finish the meal with a Chocolate Resolution featuring dark chocolate, raspberries, and cinnamon crisp. For reservations, call 602-635-4965. For more information, visit www.theherbbox.com.